New York City – I was walking down 2nd Ave in Manhattan when I heard a crowd. I looked around more carefully at my surroundings and realized that I was at Dag Hammarskjold Plaza. I remembered the location from having danced at a Holi festival there about a year and a half ago. But whereas then, the grey courtyard had been filled with bright colors and laughing, rowdy people, the people in the Plaza now held a different kind of energy. It was a sea of somber faces and covered heads. Fiery, passionate eyes gazed toward a stage where a man’s voice rang out in a beautiful but desperate melody. The colors red, black, white, and green were dotted everywhere. As I crossed the street to get a closer look, I saw the Palestinian flag waving in the distance and could read the words “free Gaza”, “racism”, and “genocide” on countless posters. I have never been to any sort of political rally before. I’ve generally preferred to read or watch the news and discuss it with friends. And, in the effort to be completely honest, I don’t think I’ve read enough about the Israel-Palestine conflict to consider myself “fully informed”. My only real opinion about it is what I think of all such conflicts – that it is horrifying that the political aspirations of a few powerful people should cost the lives of so many civilians. In the past few months, my Facebook news feed has been filled with friends posting their own opinions and others’ on the conflict. Perhaps motivated by them, I decided to check the rally out. I could tell from the speakers on stage that I had arrived at the end of of the event. Still, it seemed like at least a couple hundred people were around, taking photos, handing out flyers, and answering reporters’ questions. I accepted some flyers and looked around to see if I might be able to speak to one of the organizers (NY4Palestine) to get some more information. Then, in the audience, a young woman caught my eye. 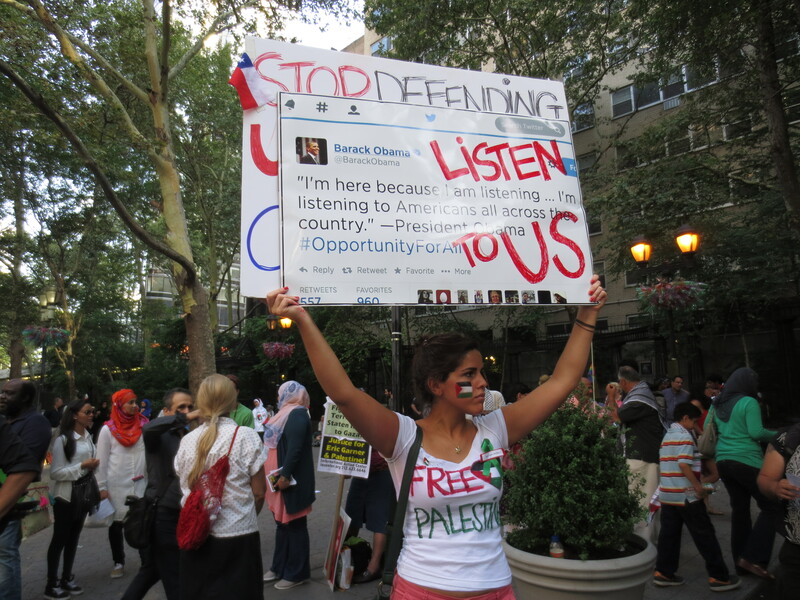 She was bedecked in Palestinian colors, and her arms were stretched tall above her, holding two huge posters. Her jaw was set, and her eyes were fierce. I decided that she – someone who looked my age but was clearly so passionate about this cause that she came fully prepared for this event – was someone I really wanted to meet. I waited as various reporters and other attendees took pictures of her and her signs, and then asked if I could interview her. She agreed, and we began. Her name is Michelle Cassis. She was born and brought up in Chile and moved to New York two years ago. She is 24 years old, and she is a filmmaker. From the way she spoke, it was clear that Michelle had kept herself well informed of the conflict. She spoke of the shocking loss of life in Gaza and about the imbalance of power between the Israeli military and the Palestinian defense. She talked about the Israeli propaganda that has flooded mainstream media through the use of phrases like ‘self-genocide’ and ‘self-defense’ (she called it “auto-defense” – I assume it’s a linguistic leftover from Spanish to English translation). However, she also spoke about the difficulty civilians and press with Arabic last names have in traveling to the region, how news is abundantly available now and how important it is to “read everything“, and how we have a duty to use social media (she called it “our civilians’ weapon”) to spread the word. I didn’t need to ask her many questions – she already had a message that she was focused on passing on. For me, it was both eye-opening and inspiring. I am often skeptical of young activists. I generally think of them as zealously passionate about a cause they have little understanding of, simply because they are swept up in the drama of protesting something. I spent less than an hour with Michelle, so it’s possible that I am mistaken about her, and that she too falls into this camp. Regardless, I could tell that the plight of the people in Gaza had seriously impacted her and that she was making every effort to keep up-to-date on what is happening there. Her determination to not be passive and to stand for what she thought was right really struck a chord with me. I wanted to find out more about her background. I learned that Michelle’s grandfather was born in Palestine and that she is the fifth out of six siblings. She told me about how one of her sisters passed away a few years ago from leukemia, and how her father told Michelle that the situation in Gaza had become so bad that it upset him more than when her sister died. She told me how when she first learned of the recent streak of violence, she felt so sick that she lost her appetite for a week. She told me that she took every opportunity she could to attend rallies like the one we were at. She wants to take advantage of the fact that she lives in the same city where the UN is headquartered. She said that it is important to her that when her future children learn about these events in school, they know that she stood on the right side of history when it happened. After the interview, Michelle and I continued chatting with each other and a couple other attendees of the rally. We spoke with one (white, American) man about the lack of unbiased news sources in the US and general American apathy and ignorance about world conflicts. We discussed that such ignorance may exist because people’s everyday lives in the developed, western world strike such a stark contrast with the constant terror depicted in news stories about other countries – that it may be too stark a contrast for many people to mentally handle. Another girl came to take a picture with Michelle’s signs and prompted us all to exchange Facebook information. In a political and human conflict such as this one, there are millions of stories and accounts of events. Truthfully, I felt that I could have spent much longer talking with Michelle and the other people at the rally. I found myself wishing that I had known about it earlier and had had time to prepare. I have so many questions both about the conflict itself and about what motivates people like Michelle to actually take part in such rallies. If you were in my place, what questions would you have asked? What are your views on activism? Have you ever been to a political rally? Comment below, and let me know!